Canyoning (known as canyoneering in the U.S.) is traveling in canyons using a variety of techniques that may include walking, scrambling, climbing, jumping, abseiling, and/or swimming. 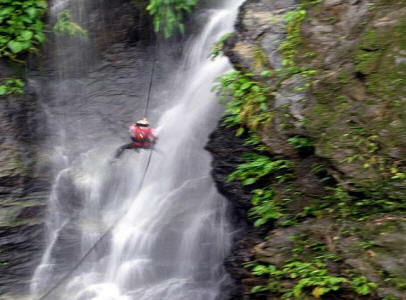 Although hiking down a canyon that is non-technical (canyon hiking) is often referred to as canyoneering, the terms canyoning and canyoneering are more often associated with technical descents — those that require rappels (abseils) and ropework, technical climbing or down-climbing, technical jumps, and/or technical swims. 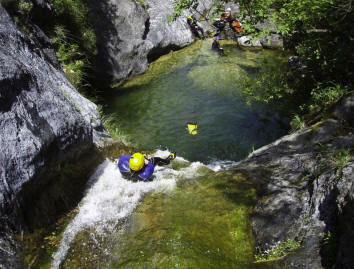 Canyoning is frequently done in remote and rugged settings and often requires navigational, route-finding and other wilderness travel skills. Canyons that are ideal for canyoning are often cut into the bedrock stone, forming narrow gorges with numerous drops, beautifully sculpted walls, and sometimes spectacular waterfalls. Most canyons are cut into limestone, sandstone, granite or basalt, though other rock types are found. Canyons can be very easy or extremely difficult, though emphasis in the sport is usually on aesthetics and fun rather than pure difficulty. 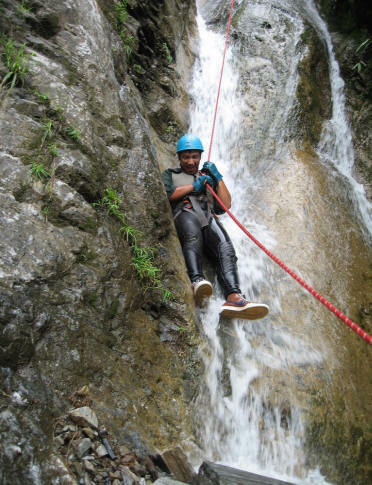 A wide variety of canyoning routes are found throughout the world, and canyoning is enjoyed bypeople of all ages and skill levels. Safety briefing byour professional guide - 10 to 15 minutes. Distribution of abseiling gear. Watch a demo on how to use it the correct way as well as encouraging you to gain self confidence. 1015 hrs Commence abseil down the 18 meters of waterfall. Feel the cold refreshing water splashing thru all parts of your body and that’s when you never thought it was possible. You will start moving down very slowly, but as you get more practice and as your confidence grows you will be coming down in just a few leaps and bounds. 1300 hrs Return to the lodge for lunch and to freshen up. After lunch return to pick up point. Please bring sun block, t-shirt and shorts, towel, and change of clothes, sneakers or river sandals, waterproof camera, goggles for those who wear contact lenses, spectacle strap for the bespectacled, mosquito repellent, torchlight and comfortable walking shoes. Transport can be arranged from Kuala Lumpur to Gopeng. Please enquire for more information. Other packages or combination of packages and accommodation are also available. Solving the problems dealt byrock and water requires creativity. Overcome these problems with technology and hardware is possible, but it is more challenging and more fun to rely on wits and ingenuity. 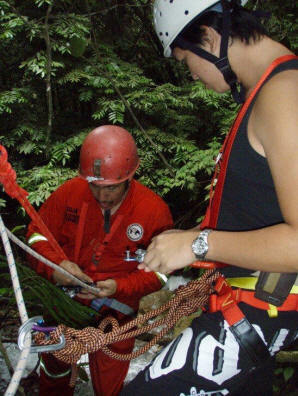 Canyoning can be physically demanding. 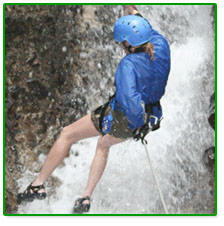 A typical day may involve hiking, wading, swimming, rocking climbing and rappelling. Some people challenge themselves to stay dry and attempt to climb around every pool. Others challenge themselves to leave the rope in their pack and attempt to down-climb as many drops as possible. Many are drawn to the canyons in search of peace and tranquility. They tend to move at a slower pace, absorbing the sights and sounds that provide such a welcome contrast to the hustle and bustle of modern city life. 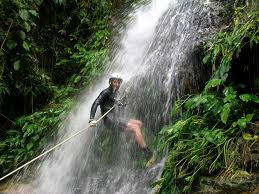 Some are drawn to the activity for the rush of jumping, sliding and rappelling over waterfalls. 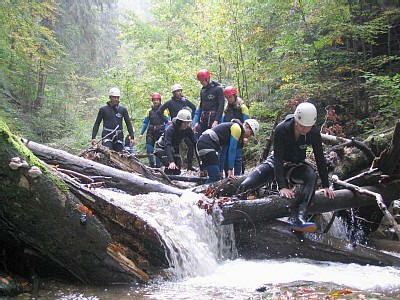 No matter why or how people choose to pursue it, canyoning is addicting and certain to attract enthusiasts in ever-increasing numbers in the years to come. As far as I am concerned, the term ‘canyoning’ refers to travel down any stream byfoot that requires technical equipment and/or ability. Sure, a 'slot' canyon with 30m walls and only 1m in breadth is a true canyon, but excellent adventures can be had in a steep mountain stream that passes through gorgy sections. They don't have to be steep necessarily, only to have rappels, technical down climbs or technical slides/jumps/swims. If I have to take rappelling gear and there are places along the way were escape is impossible (due to steep slippery walls on either side) then I'm going canyoning. Floating or swimming through a gorge with tyre tube and/or wetsuit is more 'gorging' or 'tubing', a sport which seem to have a bit more followership in NZ amongst keen tramping types. Canyoning grading systems tend to consider a variety of factors, recognising each in an overall alpha-numeric grade. It’s striking that water difficulties aren’t considered, making the system of little use.